The Fibonacci SuperTrend indicator is based on one of my favorite swing trading strategies to date. While the strategy is fairly simple, the description is a bit lengthy for this post. However, there is a detailed video on the trading strategy by clicking the button below. The SuperTrend indicator is a very common tool used amongst traders. It is widely available for free download across the Web. Typically it is used as a method of determining trend direction, and is often used as a trailing stop or entry method. The SuperTrend indicator is usually displayed similar to that in the image below. The indicator itself is fairly simple. The first thing the indicator looks for is to establish a trend in the market. When the trend is bullish, the indicator will plot a green line below the market. When the market trades below the green line, the trend changes to bearish and the indicator plots a red line above the market. The calculations for the green and red lines are dependent on the Average True Range indicator, and a user defined Multiplier parameter. The one caveat is that in in a bullish market, the green line is not allowed to decrease in value. Likewise, in a bearish market the red line is not allowed to increase in value. The Fibonacci SuperTrend indicator looks similar to the original SuperTrend indicator. The indicator starts be establishing a Trend in the market. 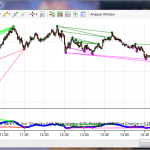 The Fibonacci SuperTrend defines trends according to breakouts in the market. A bullish trend starts when the market breaks above the highest high of the previous ‘x’ bars, where ‘x’ is a user defined value. The bullish trend will continue until the market breaks below the lowest low of the previous ‘x’ bars. No problem. I’m glad you like the free NinjaTrader indicator. Don’t forget to share this with your friends on Twitter, Facebook, etc. I like this indicator a lot! It would be good if it included values in the code that could be used in a NT Market Analyzer column to indicate the reversal arrows when they occur. Is this possible? It is certainly possible. Please visit the Custom Programming link above for modification requests. I’m sorry but I’m not sure I understand your question. What do you mean when you refer to the “NT GUI”? Are you referring to the Strategy Wizard window? Do you have an NT8 version of the Fib Supertrend indicator? There is not a version of the indicator for NinjaTrader 8 yet. It will be coming in the near future.